Did you know that the staple of India restaurants – chicken tikka masala – isn’t even Indian? This was one of the many interesting things the Accidental Locavore learned over a fun tasting dinner at Baluchi’s FRESH, a new fast-casual Indian restaurant. According to Rohan, Baluchi’s president, it’s a British interpretation of butter chicken and is actually the national dish of Britain (wouldn’t have been my first guess – you?). 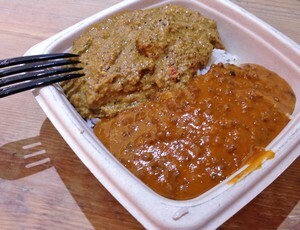 That doesn’t stop them from having two fine versions, one of which is actually tofu tikka masala. Since the curries come two to a plate with basmati rice and naan, you can try both versions, or switch it up with classics like lamb rogan josh or saag paneer. Besides sourcing as much as they can locally, Baluchi’s is offering specials a bit more off the beaten path. When we were there, there was a terrific dish, subz muloni, made from a variety of peppers in a peanut sauce – a bit spicy and quickly devoured! 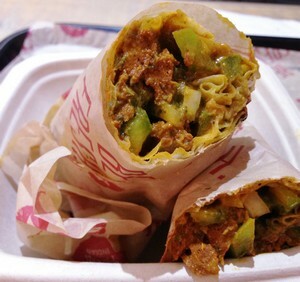 In addition to the curries, there is a selection of roomali rolls, an Indian version of a wrap, but using a much thinner “handkerchief” bread which is enough to hold in a variety of fillings (we had a nicely spicy lamb one) without being overly bready (my issue with wraps – nothing but bread at the ends). A mango lassi was great for cooling off the heat from the lamb. 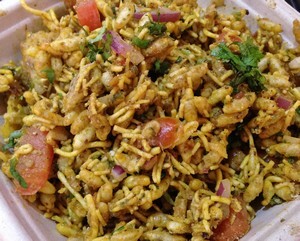 My favorite dishes were what they call “Extras.” In my opinion, these should be renamed “Essentials,” as you’d be crazy to walk out of there without trying the best dish we had, the bhel puri. It’s a cold dish of crisped rice, tomatoes, onions, cilantro, mint chutney (made fresh daily), tamarind and the spice mix known as chaat masala – fabulous! The other surprise was the aloo paapri. 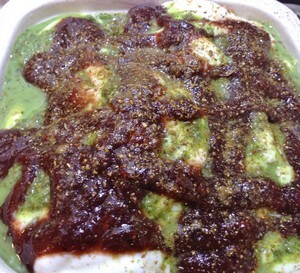 Also cold, it had a base of potatoes and chickpeas covered with yogurt, tamarind sauce and cilantro chutney. You can’t go wrong with either one of them and at $4.95 each, a steal in midtown Manhattan! 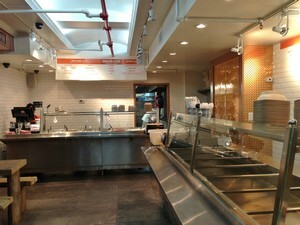 Baluchi’s FRESH is open for lunch and dinner. Seating is at rough-hewn picnic tables in a spotless dining area, or you can take a picnic to nearby Bryant Park. 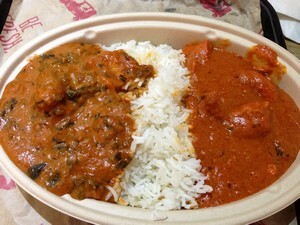 Prices are extremely reasonable, the most expensive item being the curry combo at $9.95 and delivery is available. Rohan wants you to try some of the lesser-known dishes as well as the seasonal items they’ll be cooking up (pumpkin is rumored to be making an appearance shortly), so the staff is happy to give you tastes. Go for the real Indian food, you’ll be glad you did; I know I was!